Color By color By Color……. So this is my big resurrected project, the Color By Color scarf by Kathryn Alexendar in the “Scarf Style” book. I started in with a knit-along last winter and after getting through the first 10 sections, got tired of it and put it away. Now first of all, I have to say I absolutely LOVE this scarf. The color and design are amazing and I can’t wait until the day comes when I can actually wear it. However, I have to say this is by far the most complicated item I have ever knit and it gives me a headache half the time I’m working on it. 1. We are dealing with 48 colors, all in little 8 yard strands of Paternayan embroidery yarn, which has to be separated from 3-ply to 1 or 2-ply. Keeping track of all that is a headache right there. 2. The blocks never seem to match up. The guage is never quite right and you have to do a lot of fudging to make it all fit together. 3. I-cords everywhere. Section 12 has 30 of them alone!!!!! 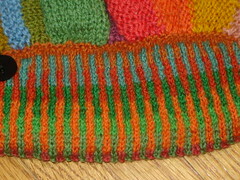 All on size two needles, 2 or 3 colors each. I get a tension headace just thinking about it. So here I am, back to the scarf. I really love this thing, despite the complications, and in the last two weeks of winter break I finished the fair isle section and section 12. Can I keep up? That is the question!! !